What does this attack say about the caste equation? The lynching of a Dalit farmer in Porbandar is only the tip that signals the existence of an iceberg of atrocities on the lower caste regularly inflicted by the upper caste in Gujarat, a state touted to be a model of development. Social humiliation and atrocities at other levels on lower castes in Gujarat are routine affairs, but they do not make news unless the victim loses his life as it happened in the case of Rama Singrahiya of Sodhanpur village in Porbandar - the district where Mahatma Gandhi was born. The 42-year-old Dalit lost his life to the tyranny of the upper caste simply because he had attempted to upgrade his economic status by undertaking cultivation on government land earmarked as 'Gauchar' (grazing land), an activity the upper caste people routinely do on larger chunks of land as well. This Dalit farmer was beaten to death by the influential Mer community people. The Mers are the dominant upper caste of Porbandar to which belonged the controversial 'Godmother' - the lady don Santokhben Jadeja who has been terrorising the area for two decades. The 'cardinal' sin of Rama Singrahiya was to cultivate castor seeds, a cash crop that signifies an attempt to climb up the economic ladder rather than just subsistence farming as most Dalits do. Clandestine cultivation on government-owned 'Gauchar' land is widespread in Gujarat, says eminent social scientist and author Achyut Yagnik adding that it is done by people of all castes. Whichever caste is dominant in a particular area, would have a major chunk of the 'Gauchar' land under their illegal command, he explained. While illegal farming is done by all castes in their 'share' of Gauchar land, the upper castes get agitated whenever the lower caste people start cultivating a cash crop, said Yagnik about the probable genesis of the upper-caste antagonism against the Dalit farmer lynched in Porbandar on Wednesday. Almost an exactly similar incident had happened in Vanthli taluka of Junagadh district in July 2001 when the upper caste people had "expelled" 100-odd Dalit families out of the village for their "audacity" to cultivate the cash yielding groundnut in the 'lower caste' portion of the illegally utilised Gauchar land. After camping outside the Junagadh Collector's office for over a month, the 100-odd Dalit families got a semblance of justice only after a notice from the National Human Rights Commission (NHRC) taking a strong note of the forced migration. Attempt for an economic upward climb is not the only Dalit activity that can annoy the upper caste in Gujarat. Taking side with the law to stall any illegal economic activity of the upper caste too may spell doom for the Dalits in the business-savvy state. 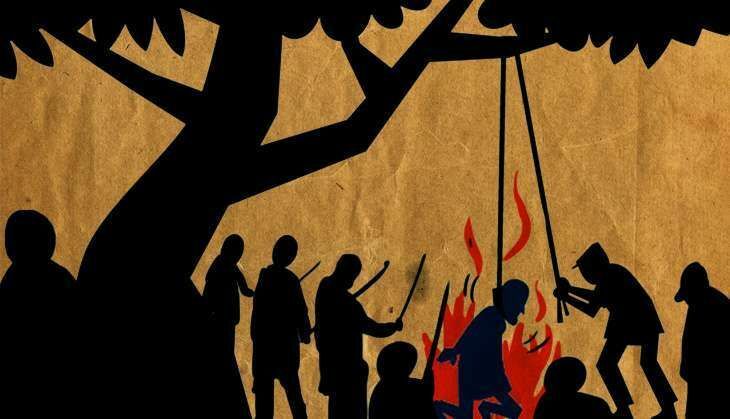 A Dalit was burnt to death by upper caste people in Una taluka of Gir Somnath district eight years ago for complaining to the Collector about illegal mining activities near his village. The culprits are now in jail facing trial for the murder but other upper caste people have terrorised his family so much that his father of the deceased met the then chief minister who assured him a piece of land in another village. Emotionally surcharged Kalubhai and his son said that they would commit suicide if the land was not handed over to them by the promised time. The police arrested the Dalit duo ten days ago on charges of threatening to commit suicide, says human rights activist Ashok Shrimali. Humiliation, harassment and tortures of Dalits not amounting to deaths or grievous injuries normally do not make news here as these are taken as normal incidents which are 'bound to happen' once in a while. In April this year, a 24-year-old Dalit, Chetan Vaghela had mounted a horse as part of his baraat procession. The upper caste Rajputs attacked the wedding procession and pulled down the groom from the horse simply because they didn't like the idea of a Dalit boy riding a horse in their presence. Another lower caste boy in north Gujarat was denied a hair cut at a salon when the upper caste people threatened the barber of dire consequences. According to Alpesh Thakor, President of the OBC, SC, ST Ekta Manch, Dalits in as many as 2,000 villages across Gujarat are not allowed to draw water before 2.00 PM in the afternoon even from wells earmarked for the lower caste people. In the case of police firings at clashing groups too, usually, more Dalits fall prey to the bullets than the upper caste. A case in point was the clash between Dalits and upper caste Darbars at Thangadh of Surendranagar district in September 2012. When the police fired at the clashing groups, as many as three Dalit youths were killed while others received only minor injuries.